Organizing your money doesn’t have to be a big ordeal! It can be simple and satisfying. All you need are ten minutes, your phone (or computer), and a giant piece of chocolate cake. Okay, the cake isn’t strictly required, but we highly recommend it. Here are three insider tips for creating an EveryDollar budget that would make a library look disorganized. Yeah, you’re that smart. Sorry math whizzes, there’s no number crunching involved with an EveryDollar budget. You just plug in what you want to spend, save, and give for the month, and we make sure it all equals zero. If you’re over budget, we’ll let you know. That way you’re not panicked and trying to find money for groceries with half a month left to go! It’ll be perfectly planned for you already. Budgeting to zero also means not having extra money just hanging around. Go ahead and put those pennies toward your vacation fund, restaurant money, or debt payments! If it goes unaccounted for, it will disappear—and fast. We like visual aids. They’re pretty and they make us happy. That’s why we created this lovely chart for you to see your budget at a glance. It makes keeping up with your money easy and appealing. This pie chart shows you what you planned to spend, what you’ve spent so far, and how much money you have left to spend. It couldn’t be cleaner. You can see an overview of your money at a moment’s notice! We think it’ll make you pretty happy too. As the month unfolds, things change. Maybe groceries were a little less, but gas was a little more. That’s why it’s important to track your spending as you go. This is where EveryDollar Plus shines. It makes tracking your money a cinch by connecting to your bank and uploading your transactions for you. Open the app and you’ll know exactly when you have a new payment or deposit ready. All you have to do is drag and drop them into the right categories! You can also use the free version of EveryDollar and manually type in your transactions. Just be sure to keep your receipts or do it right away, so you have an accurate picture of your money. On your iPhone? Switch to Plus within the EveryDollar iPhone App by going to Settings. Did we mention how easy budgeting can be? After you set it up, keeping up with it is even easier. Thank you modern technology! 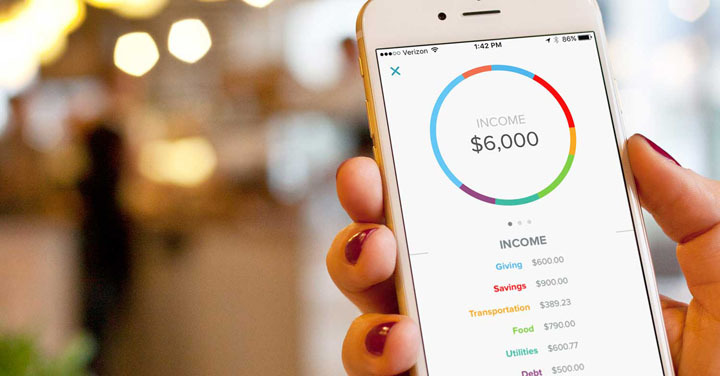 Go ahead, see how free you’ll feel when your money is in its rightful place with EveryDollar. And grab some coffee to chase down that cake.